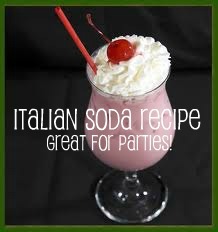 I have always loved Italian Soda! It is perfect for parties and tastes delicious! Add 1 scoop of ice to your glass. Sonic ice is the best and they sell it by the bag. Add whip cream on top and ENJOY! This drink is a must have at your next party! If you have a different recipe let me know… I am always up for something new! I worked at a cafe that sold italian sodas and we made the recipe almost the same but we used 7up/sprite instead of the club soda. I’ve never tried it with the club soda but if you don’t have that around you could always find sprite anywhere!